Clark Gracie is currently giving a seminar tour of Europe and he spent the weekend in Belgrade, Serbia where he conducted a highly successful seminar at Kimura BJJ Serbia which was attended by over 100 BJJ practitioners. Grobari (English: Gravediggers or Undertakers) are the organized supporters group of the Serbian football club Partizan Belgrade. They are one of two major football fan groups in Serbia. They generally support all clubs within the Partizan multi-sports club, and mostly wear black and white symbols, which are the club’s colors. They have a very controversial reputation in Serbia and Europe due to their violent encounters with rival fans and police and their. 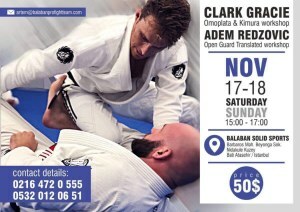 Next weekend, for the first time in Turkey, Clark Gracie and Adem Rezdovic will hold a joint BJJ seminar in Istanbul at Balaban Jiu-Jitsu Academy. Guests from all over the region will be attending including BJJEE.com’s editor Gile Huni.